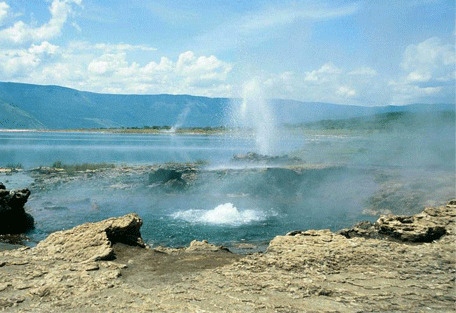 Lake Bogoria is a saline lake that lies in a volcanic region of Kenya's Rift Valley, a little north of the equator. 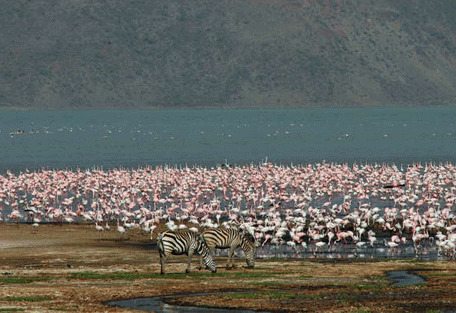 Lake Bogoria is the seasonal home to one of the world's largest populations of lesser flamingos, turning the lake pink. 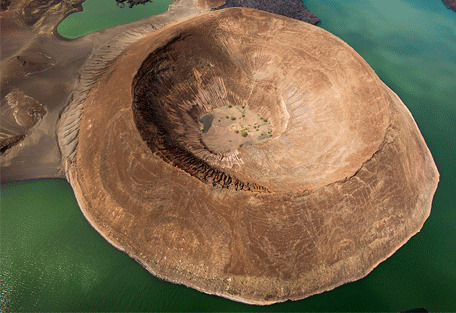 Lake Bogoria is a saline, alkaline lake that lies in a volcanic region south of Lake Baringo, a little north of the equator. 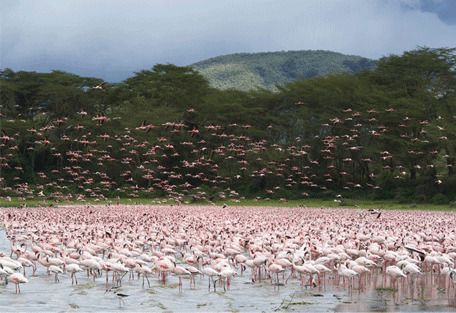 Lake Bogoria, like Lake Nakuru and Lake Elmenteita in Kenya's Rift Valley, is home, at times, to one of the world's largest populations of lesser flamingos. 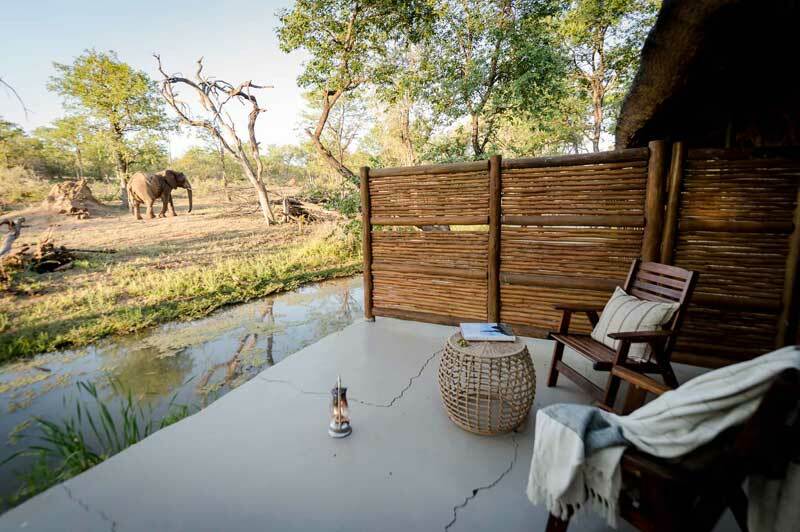 Backed by the green flanks of the Siracho Escarpment the lake's barren shores make for a dramatic scene, whilst the small reserve that surrounds the lake is a really quiet backwater with some excellent birding in particular. In 2002 the lake was declared a Ramsar site, meaning that it is a protected wetland area, while Lake Bogoria National Reserve has been a protected National Reserve since 1973. Local features include the Kesubo Swamp to the north and the Siracho Escarpment to the east - both within the National Reserve. The lake is also famous for its natural geysers and hot springs, which are situated along the bank of the lake and within the lake. 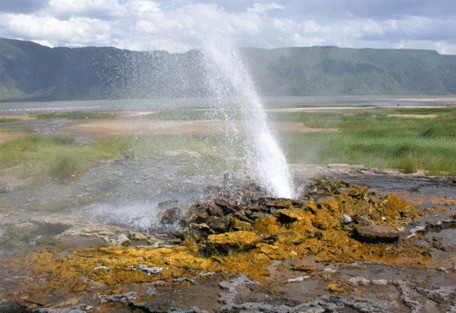 Some of the geysers erupt to a height of 5 metres, and the water bursting through the lake can be searing hot. Lake Bogoria is most famous as being one of the few destinations that is flocked to by millions of lesser flamingos during the migratory seasons. Is is a spectacular sight to see the shallows of this salt lake stained pink by the mass of birds. Local women sell produce at a nearby stall, where visitors are encouraged to buy raw eggs to take with them to the hot springs and submerge them in the water in attempt to boil them. The high levels of evaporation at the soda lake have left behind a high density of salts and minerals in the water, which makes it inhospitable for fish and is not suitable for swimming in. Although there’s plenty of wildlife in and around Lake Bogoria, it tends to make itself scarce, with the exception of the flamingos at the hot springs. Most animals prefer the eastern shore, which is slightly less accessible. Lake Bogoria Hotel offers a variety of accommodation such as camping sites, executive suites, cottages and standard rooms. 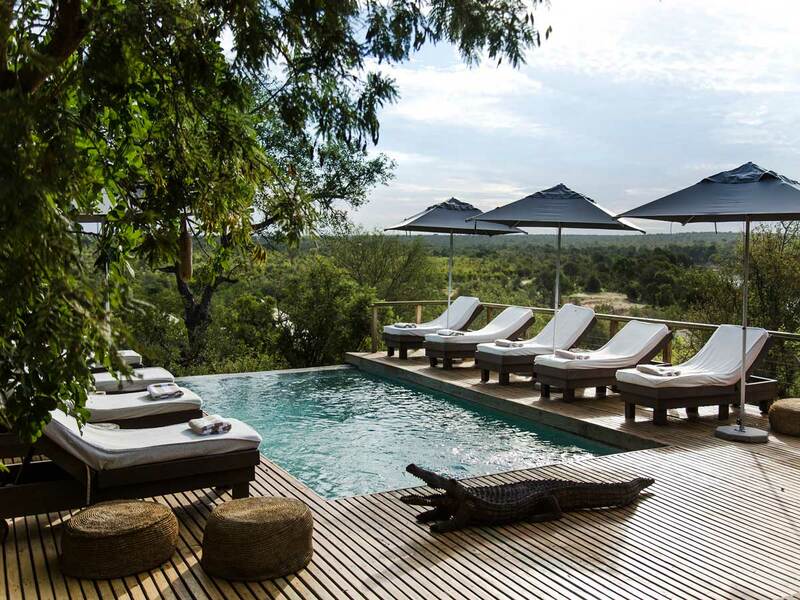 The hotel is popular for its spa which is the only naturally warm water pool in Kenya and East Africa. 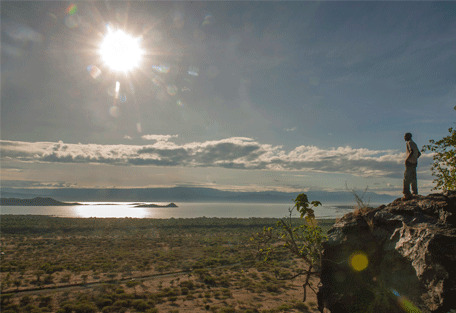 Like neighbouring Lake Baringo, Lake Bogoria is not frequently visited, often with only a handful of vehicles each day, making one's experience there uninterrupted and serene. Lake Bogoria has become the adopted feeding ground of tens of thousands of lesser flamingos, and the lakeshore is one of the few places where greater kudu antelope can easily be seen. The physical spectacle of the Lake is quite something with a largely barren, baking wilderness of scrub and rocks, from which a series of furious hot springs erupt on the western shore, while the opposite shore is backed by the rising walls of the Siracho mountain range. The natural environment at Bogoria houses buffalo, hyena, klipspringer, impala, dik-dik, zebra, warthog and Grant’s gazelle. 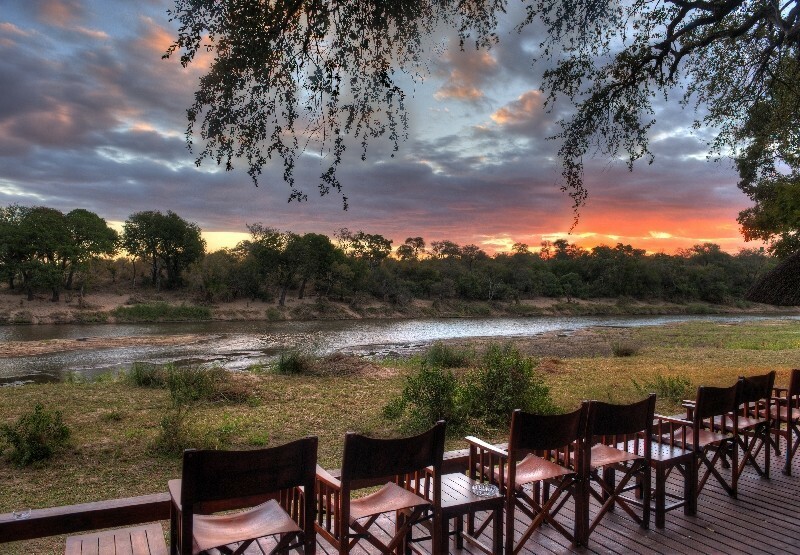 Greater kudu can be spotted all around the lake, while the flamingos tend to flock in their greatest numbers to the shallows on the western shore, where the hot springs flow into the lake. 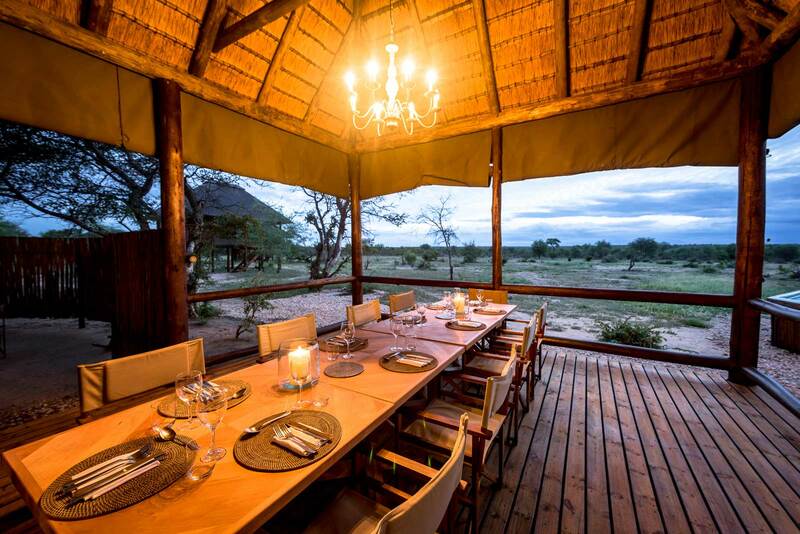 There are many options for accommodation in Kenya's Rift Valley, encompassing all the major lakes and their national parks. Guests have an array of accommodation options to choose from, but in Lake Bogoria's immediate vicinity, there is only one recommended hotel. Taking on a bit of driving, guests can choose from a variety of options; however, Lake Bogoria Hotel is a spa resort that offers a range of room types. Lake Bogoria Hotel has a wide variety of accommodation, consisting of 25 standard rooms with bath tubs and garden-facing views; 33 spacious cottages with the Keon Hills as a backdrop; 5 executive rooms; and 20 spacious tents with ample facilities and a bonfire. The hotel has 2 swimming pools - a refreshing, cold pool, and the famously known 'spa pool', which is the only naturally warm water pool in Kenya and East Africa. Locals believe that the mineral content of the water has healing effects on the skin and body. 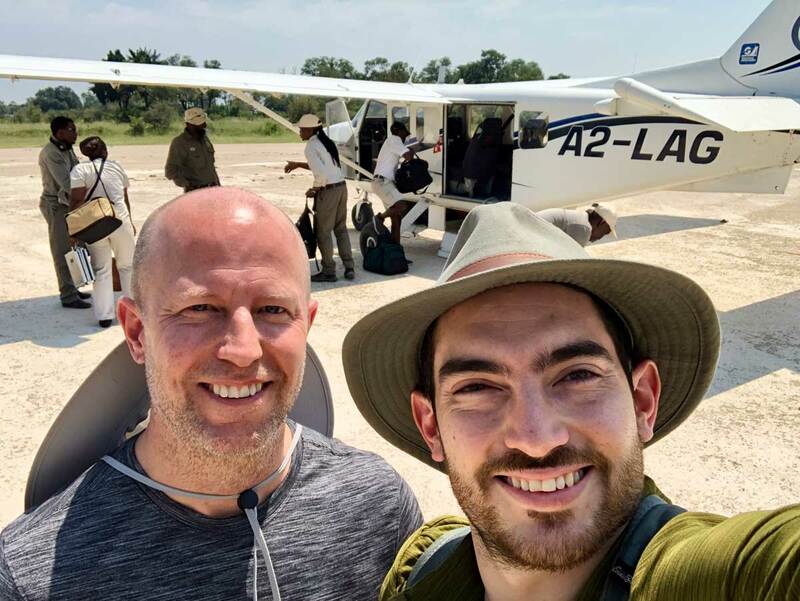 Guests will take a scheduled flight from Nairobi to an airstrip nearest their destination at Lake Bogoria.